Harold William Withrow of Charleston, formerly of Dunbar graduated to his heavenly home on February 5, 2019 after a short illness. He was preceded in death by his best friend and loving wife, Norma Jean Jenkins Withrow, his parents, William Lightburn “Jeff” Withrow and Eva Withrow, his brothers, Roy and Clarence Withrow, and sister, Laura “Sis” Withrow and her husband Retsel, who was like a brother to him. Also surviving him, are several special nieces and nephews, and a few men of the church that were like sons to him, Ben Randolph, John Roberts, and Doug Humphreys. He also has a few very special friends that he hunted with and constantly called and checked in with, and he called them “Old Friends”, Rex, Jones, Mark Jones and Tony Heaton... we will miss hearing his laughter while talking to you guys! He served in the National Guard from December 1956 – October 1961. Then in September 1961 he started working for the WVDA and retired from there with 46 years total service. First, he retired as an Assistant Division Director after 27 years and then came out of retirement and served another 19 years as a Personal Administrative Assistant to the Commissioner of Agriculture, Gus R. Douglas, who was a great friend and who also preceded him in death. 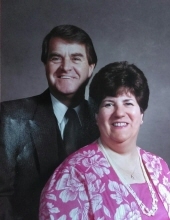 He was a faithful member of the Charleston Mountain Mission Church where he served as a board member for both the Church and the Social Services Department and was the choir director for over 50 years. To our friends, family and church family, we thank you for your calls, cards, visits, emails, and food, but most of all, your prayers. Without you standing in the gap we could not have made it through this difficult time. God bless each and everyone of you. In lieu of flowers, the family request charitable donations to be made in his name to the Charleston Mountain Mission Church, 1600 Seventh Avenue, Charleston, WV 25387. Friends may visit with the family from 6 to 8 PM at the Charleston Mountain Mission Church on Friday, February 8, 2019. His going home celebration service will be at 11:00 AM with viewing one hour prior to the service on Saturday February 9, with the Rev. Kenny Petry, his grandson, officiating. Entombment will follow in Tyler Mountain Memory Gardens, Cross Lanes. If you sang in the choir under his directing, we would like for you to sing in the choir for his home going celebration. Please come and be a part of this day. Cunningham-Parker-Johnson Funeral Home is serving the Withrow Family. To send flowers or a remembrance gift to the family of Harold William Withrow, please visit our Tribute Store. "Email Address" would like to share the life celebration of Harold William Withrow. Click on the "link" to go to share a favorite memory or leave a condolence message for the family.